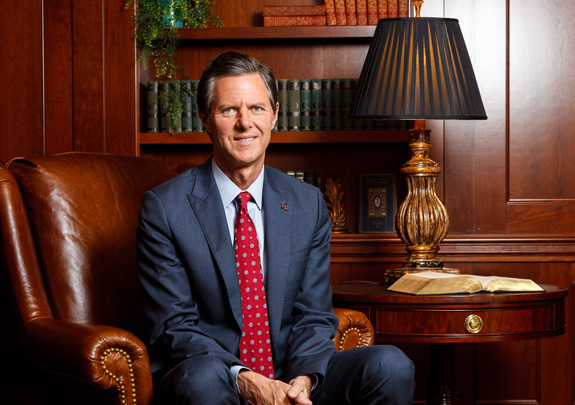 Earlier in December, Liberty University president, Jerry Falwell Jr., made headlines by encouraging students to apply for concealed-weapons permits in order to “end those Muslims.” Falwell went on to criticize our government and use fear-mongering to deliver hateful misinformation about another race and religion. I do not identify as a pacifist, but his comments shocked me. I was disgusted, as an American and as a child of God. Here on the opposite coast, my friends, classmates, and coworkers began questioning my choice to attend a Christian college as an undergraduate. News of Liberty’s politicized and violent outlook as a leading evangelical Christian college has cast doubt not only upon my own beliefs or social views but upon the alma mater that I love and respect. “How is Messiah different?” they ask. Well, how are we different? I tried explaining that Messiah stems from Anabaptist origins and, therefore, practices primarily nonviolent beliefs. Unfortunately, I discovered that this does very little in combating the assumption that because we are Christian, we are “crusaders.” The concept of denominations means very little to the majority of secular America. The tendency to pigeonhole everyone into the same box is rampant, as the whole “ISIS vs. Muslim” debate can attest to. The understanding that some Christians can be both devout and enlightened to nonviolent and diplomatic processes is not a given to the rest of the world. We can no longer assume that it is. And in the absence of this kind of nuanced understanding, some other kind of explanation must be given. I know that Messiah College tends to steer clear of political statements. It is comfortable in Mechanicsburg, and Messiah seems very far away from it all. But I do not think that we can afford to remain silent on this issue as a campus or as a community. While I am not advocating for some showy, politicized agenda, we need to make our position plain to the eyes of the world. Unless we meet Liberty’s hateful misinformation with a gentle but authoritative counter, we are by default allowing the rest of the world to continue believing that Christians are violent, racist, and fearful. We have a charge to speak up and judge fairly (Proverbs 31:9). Doing otherwise is propagating violence. For the sake of our Christian siblings who are being misjudged for words they would never say, Messiah must come forward. For the sake of our Muslim brothers and sisters who are being threatened, spit upon, and accused of crimes they would never commit, Messiah must stand up. We are not big, but we are a little light, and we are a city on a hill. It is time to shine.